Students learn marine ecology “in situ” while paddling through the Rock Islands. One of the key Blue Planet United projects is ‘experiential learning’ for university students. 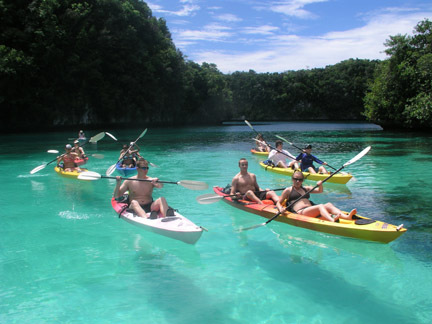 For the past 12 years, Blue Planet United working together with the University of Redlands, has taken students on a one-month intensive travel class to Palau, to study sustainable development in a country that is grappling with the tensions of modernization and the desire to preserve their culture and traditional way of life. As of 2012, one hundred and twenty students have travelled with us to Palau, and another ten are signed up to go this May (2013). The class has become so popular that 60 students asked to go this year; we can only take 10 at a time because of the size of the small eco-resort where we stay. Each student is asked to keep a journal, and at the end of the course, write an essay about what they have seen and learned. The following is the essay written by Amanda Atkins, one of the students who went with us last year. Godwin Sadao, Palauan divemaster and naturalist. In May 2012 I had the opportunity to journey to Palau, a small, tropical island republic located in the Pacific between the Philippines and Guam. This university class focused on marine ecology and sustainability. Bolstered by my fascination with the ocean and Google’s image collection of an emerald jungle paradise surrounded by crystal blue waters, I eagerly endured the 28 hours of travel necessary for the trip of a lifetime. Beyond the glamorous experiences of scuba diving among some of the highest biodiversity on the planet, exploring uncharted Rock Islands, snorkeling in secluded turquoise lagoons and hiking through rain forests, there was a great deal to be learned about Palauan culture, the many threats facing Palau’s delicate coral reef ecosystems, and the country’s potential to be sustainable. Most people tend to think of sustainability in terms of renewable energy and resource-efficient, organic agriculture. Countries known to offset carbon emissions and dedicate significant economic resources to environmental management, such as Iceland, Sweden, or Costa Rica, immediately come to mind, in addition to images of windmills, solar panels, clever eco-architecture, and acres of leafy subsistence crops. However, these ideas only hint at the vital aspect of stewardship, are only small facets of sustainability’s truer, deeper meaning and importance to humanity. An overarching, umbrella definition of sustainability refers to the capacity of a place to support itself and meet its own present needs without compromising the ability of future generations to meet their own needs. It is a balance of environmental integrity, social equity, and economic strength; attaining this balance worldwide would enable the Earth to continue supporting life as we know it. In Palau, the definition of sustainability is just as complicated, but attaining the balance of environment, economy, and social equity seems to revolve around two main things: the survival of traditional Palauan culture in the modern world, and preservation of the coral reef ecosystem in the face of many threats. On a special evening in the small city of Koror, our class was invited to a barbeque with some of Palau’s most respected elders and community leaders. Around a home-cooked traditional meal of fresh fish, fruit, and grilled taro, we discussed some of the current cultural issues in Palau, especially those concerning young Palauans. Numerous problems were listed: due to the complexity of the Palauan language, few young people are learning to speak or read it anymore, and elders fear their linguistic heritage will soon disappear completely; traditional chewing of Betel nut is being abused with the addition of tobacco, which has lead to an increase in cancer across the country; obesity and diabetes run rampant with the popularization of fatty, salty Western snacks and the decreased consumption of traditional, nutritional foods like taro, which requires extensive physical labor to grow; traditional methods are increasingly being “updated” by modern ones, as illustrated in the carving of ceremonial canoes with industrial power tools; and there is a mass exodus of young people who desire the better-paid jobs in outside countries in order to afford Western comforts and entertainment. The preservation of culture is important in the sustainability of Palau because, like the coral reef ecosystem, it is so integral to the social, economic, and environmental workings of the country. These deep connections can be illustrated in ancient Palauan legends, such as the Legend of the Magic Breadfruit Tree. The story goes that once, long ago, there was a coastal village called Ngbital, where an old woman lived. Her son often travelled and she had no other family, so she lived alone. Every day the people of Ngibtal would pass by her house as they returned from the sea with their daily catch of fish, and though they saw she was an old woman and unable to fish for herself, they never offered to share their food with her, to her great disappointment. One day the woman’s son returned after a long absence and she complained of this behavior to him. Her son went into the yard of his mother’s house and, coming to a large breadfruit tree at the water’s edge, and chopped off one of the branches. Where the branch had been, water immediately gushed from the tree, flowing to the rhythm of the waves slapping the shore, and with each surge a fish leapt out of the tree. The old woman now had a way to get fish for her pot. However, upon seeing this wonderful fish-bearing tree, the other villagers became jealous. “We must go all the way out to sea to fish,” they complained, “while this woman need only sit beneath her tree.” One night, an especially envious man crept out to the tree and chopped it down. Torrents of water immediately burst forth and covered the village, drowning all its inhabitants. “What do the coral reefs mean to Palauans?” I asked Godwin, our Peleliu dive boat captain, one bright afternoon. I had been napping in the warmth of the bow as my classmates snorkeled in cerulean shallows. Waves lapped gently at the sides of the boat, a slight breeze ruffling the pages of a book I’d used as a pillow and swishing the ends of Godwin’s dark dreadlocks. He chewed pensively on a piece of coconut. My question had been a bit vague and abrupt, so I was relieved when he answered. “The reef…it is life,” he said finally. “We live by its edge, we get fish from the waters for our food, then we bring in tourists to see the corals and fish to make money. It is our livelihood. We are connected to the reef. It is beautiful and important. We know if the reef is destroyed it will mean death for us too.” He leaned back, stretching. “And now I take you to see these things. Now you see the beauty, and you remember, and you will take it back with you.” I shielded my eyes from the sun, nodded solemnly. Palauans in general seem to possess a strong understanding of environmental importance. In comparison to many countries, Palau has been extremely pro-active about their approach to environmental management and preservation, especially in recent years. Unlike a neighboring Micronesian country, Palau declined to have a giant casino built on one of their islands. They have an active Conservation Society that works to protect both marine and terrestrial ecosystems, provides education, and encourages community stewardship of biodiversity and natural resources. In 2005 Palau pledged itself to the “Micronesia Challenge”, an attempt to facilitate effective conservation of Micronesian marine and forest resources through protecting 30 percent of near shore coastal waters and 20 percent of forest land by the year 2020. In 2009 Palau created the world’s first shark sanctuary, banning all shark fishing in 230,000 square miles of ocean surrounding the country. However, there are vast threats to Palau’s delicate and biodiverse marine environment. The 1998 El Nino devastated many corals, and the looming menace of global climate change hints at a succession of El Nino storm seasons to come, in addition to rising sea levels and ocean acidification. Despite the creation of the shark sanctuary and strict regulations on certain fisheries, illegal shark fin and giant clam harvesting still occurs. With only a handful of Coast Guard boats to patrol and protect the waters around Palau, it is exceedingly difficult and expensive (and sometimes dangerous) to apprehend environmental criminals. When poachers and law-breakers are caught and brought to justice, they tend to receive light sentences, mere wrist slaps that barely discourage them from returning to their illegal activities as soon as they return to the ocean. Tourism, which is vital to the Palauan economy, is increasing and causing new development and intensifying energy usage. A side effect of the increasing human population is an increase in sewage: the semi-treated sewage runoff goes into the ocean and the influx of nutrients in the water can cause algae blooms which have detrimental effects on the reefs. Other harmful species, such as coral-eating snails and Crown of Thorns starfish can destroy whole acres of coral, and are extremely difficult to manage because they must be forcibly removed en masse, which takes tedious amounts of time and effort. The coral reefs I experienced in Palau flourished with a dazzling array of the greatest biodiversity I’ve ever seen, and it is difficult to imagine how so much life could be at risk. While to my eyes reef life appears to be abundant, there is extensive evidence that it has been seriously depleted in the past century. Everyone from fishermen to environmental tour guides to the everyday citizen will tell you that the reefs are nothing like they were 10 years ago, or 20 years ago, or 30 years ago. It is unlikely these beautiful ecosystems will remain stable without a real change in thinking, without a renewed effort at conservation and environmental sustainability. This is certainly an “easier said than done” situation in Palau. Invest in green development and eco-tourism in order to nullify some of the negative human effects on the environment, one might suggest, but Palau simply does not have the resources of a large, rich country like the United States. While the community and youth educational programs that have been developed so far are a step in the right direction, unless those efforts become more widespread achievements will likely be minimal. Perhaps the biggest responsibility lies, as Godwin indicated, with tourists like me, who can alert the rest of the world to Palau’s plight and inspire them to do something to save these last pieces of paradise left on the planet. Soon after I returned to the United States, I joined my grandparents for their weekly Sunday lunch at the local Applebee’s with their friends from church. One of their friends, a quiet, watery-eyed man, seemed especially interested that I had visited Palau. He was in the U.S. Navy during World War II, he explained, and had been part of a recovery unit for salvageable ship parts in the Pacific. Their unit had stopped on the island of Peleliu, only months after the devastating battle that took place there. Silently I retrieved my cell phone and, through the wonders of technology, quickly pulled up a picture I had taken of present-day Peleliu, handing it over to him. He took it with shaky hands, squinting at the image displayed: a lush, dense, green forest, with thousands of ferns and tall trees and bright flowers. The occupation of Peleliu in World War II and the bloody battle that took place there is now a part of Palau’s history, and it is important not to forget one of the most bloody battles of the war. But in that moment, looking at that photo, I truly appreciated the marvelous ability of nature to bounce back, to grow and thrive again even after the most awful destruction. Just as the jungle returned on Peleliu, the coral reefs have recovered from environmental bleaching and human impacts, remaining a delicate but resilient natural resource. It is an illustration of hope: though we have made some grave mistakes and have wreaked havoc on the environment, perhaps if we act now we can lessen the blow to the planet’s future. With concentrated effort, we still have a chance to save and preserve the places, like Palau, that teem with beauty and life, for future generations to love and enjoy. Amanda Atkins is a senior at the University of Redlands majoring in biology.